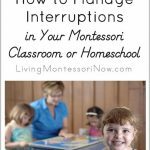 If you plan to use Montessori at home, what should you do about a schedule? Should you have a set schedule each day? Or should you just go with the flow? Obviously, for your homeschool, you need to find what works best for your family. Most children (and parents) are happiest with some sort of a schedule. Setting a schedule is very helpful, as long as you allow yourself to go with the flow when needed. I like the idea of creating a “daily rhythm” for your family. Counting Coconuts and The Magic Onions have lovely posts on setting rhythms for a Montessori homeschool (Counting Coconuts) and a Waldorf homeschool (Ariella from Childhood Magic’s post at The Magic Onions). You could also have a schedule similar to that of a Montessori school – if you allow for your child’s natural rhythms. In a Montessori school, the work time can’t be adjusted for one child. The beauty of a homeschool is that you can adjust your work time so that you don’t interrupt your child’s concentrated work. That said, most Montessori preschools have a 2½-4-hour half-day schedule. Some Montessori school schedules are part of a daycare program whereas other schools function as a preschool. 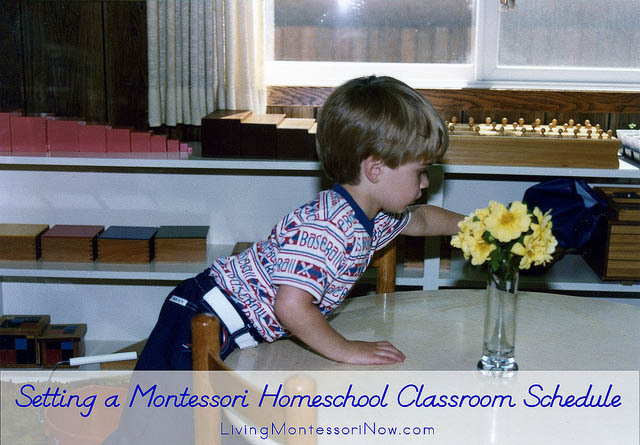 When I owned a Montessori school, I had separate morning and afternoon classes of 2½ hours. The 2½-hour time period worked best for the parents in the area who wanted preschool but not day care. 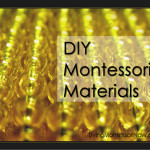 Typcially, a 3-4 hour schedule works best for a Montessori program. A child cleaning at the end of the individual work time in my Montessori school in 1981. 9:00-9:15 First Line Time (often called Circle Time or Group Time). In Montessori schools, the children and teacher typically sit on an ellipse or circle marked with colored tape on the floor. 9:15-10:45 Individual Work Time. The children would put away their work before getting out new work, but there was a brief cleanup time at the end as well. During the first line time, we often talked about the day and calendar. Then I demonstrated a practical life activity and showed how to use another material in the classroom. I typically had a third lesson as well (on a concept such as counting, geometric shapes or solids, phonetic sounds, foreign language terms, or a science or geography concept). During the individual work time, the children were free to choose work they’d been introduced to previously. They worked alone or with one or two other children. I worked individually with one or two children at a time as well. During this time, two children at a time got out their snack, ate, and put away everything from their snack. During the second line time, we had a story and then an activity such as singing with guitar accompaniment, rhythm sticks, finger plays, poems or songs with sign language, walking on the line and extensions, stunts and tumbling, or games. A similar schedule could be used in your homeschool. My son was a student in my Montessori school from ages 2½-3½. 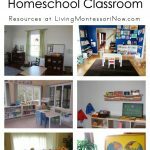 We started our Montessori homeschool when Will was 3½ and a Montessori teacher shortage at the time caused me to close the school. Because Will was used to the school schedule, we used a similar schedule for our homeschool in the morning, except we extended the individual work time as long as possible to strive for a 3-hour work cycle. 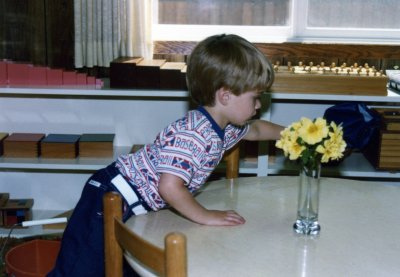 Afternoons were left for other activities, although Will was always allowed to use the Montessori classroom if he wanted to later in the day. Will and Christina are 5 years (and 2 days!) apart in age. When Christina was a toddler and preschooler, we adapted our homeschool to Will’s schedule. We did some reading and activities together, and Christina chose her Montessori work or did work with me when Will worked independently on his schoolwork. Some of the Montessori cultural materials are appropriate for both preschool and elementary students and could be introduced for both levels. We also used KONOS unit studies, which had Montessori-compatible discovery learning. Will, Christina, and I often read books together. Then we did some activities (or parts of activities) together and other activities independently by level. What type of schedule works best for your family? Thanks for your comment, Carey! I’m SO glad my post helped! I love the links! Thanks so much for finding and sharing other great sites. I’m trying to figure out a schedule here. I’ve tried several in the past for our days but they seem to fizzle out. I like this concept of our daily rhythm or the kids daily rhythm. Maybe I need to be more observant of the kids and what we natually do rather than trying to dream up some idealized schedule that is often to rigorous and flops or just not us. Thanks! Thanks, Michelle! I love the “daily rhythm” concept, too. It really acknowledges the ebbs and flows of daily life and allows for some structure as well. Secondly, would you believe your example schedule is EXACTLY the schedule I’ve decided on for our upcoming school year? Would’ve saved me a lot of head scratching and cross referencing to see it all in one lovely post like this! 🙂 Ah well, it’ll surely help others as they plan their year. Thanks SO much for your kind words, Mari-Ann! How fascinating that your schedule matches the one I listed! I hope you have a wonderful year – although I’m sure you will with your amazing homeschool! We are slowly finding a rhythm. Our oldest went to a Montessori school, where I taught, in the afternoons last year. This year I work mornings so we work in the afternoons. Some delicate work is done before bed, to keep it away from our two 2 year olds. When I am working.g, my husband keeps art s focus as well as free play. Thanks for your comment, Jessie! I love how you’re finding the rhythm that works for your family – and how WONDERFUL that your husband is so actively involved! I think that the word “rythmn” makes me feel much less stressed than the idea of a rigid schedule. I’m going to use that term from now on. Thanks, Deb!!! Thanks, Sue! And thanks to Counting Coconuts and the Magic Onions for giving wonderful descriptions of creating daily rhythms. The word “rhythm” really does have a nice feel to it, doesn’t it?! Thanks for your kind words! We also found learning best in the morning – even though we’re a family of night owls. I think many families start their morning earlier than we did, though! Happy iFellowship Wednesday to you, too! Thanks for stopping by, Amy. Happy iFellowship day to you, too! Hi, Deb! Thanks so much for stopping by and saying hello!! I will have to spend some time looking around your blog! 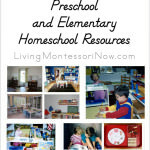 I have a friend whose son goes to a Montessori preschool who may be interested in homeschooling. I’ll have to pass your link along to her, too! Thanks for visiting and taking the time to comment, Carrie! Many of the Montessori principles and activities work very well for families with children in Montessori schools – as well as for homeschool or any other school situation. Thanks for letting your friend know about me! Deb, This is an excellent post! Thank you for sharing details about your rhythm and schedule for each day. Thanks for your kind words, Robyn! I love the focus now on rhythms – a great, new term for creating family/homeschool schedules that really work. Just had to hop over today! Happy iFellowship Day! Thanks for stopping by, Penny. I hope you’re having a great iFellowship day! We’ve adapted a new schedule this year, which so far (day 5 using it), is working well. During this first “Triangle Time,” we do some sort of shared experience together, such as reading or reciting a poem or singing a song or even sharing a learning YouTube video. It’s been peace and cosmic connectivity related so far. And the kids contribute if they read or saw something they want to share. We write the date in our journals, share our workplan for the day and take notes on anything we cover that is important to our homeschool–new rules, lessons learned…most of which are child led. And we edit a sentence on a whiteboard together. If we haven’t used up too much time, I do a group presentation. It does feel tight some days, but it also feels VERY focused and productive. I should point out that we don’t do this 5 days per week. But we try to follow this plan at least 3 days per week. My daughter would like to do it 5 days per week. That is until I remind her that it doesn’t leave much time to “get out,” of our classroom and explore the world. As you probably guessed, that is what we do the other two days per week: Explore the world outside of our home! Isn’t that really what Montessori wanted? Thanks SO much for taking the time to tell us your schedule, Staci! 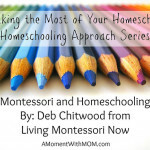 How wonderful to read about a Montessori elementary homeschool schedule that’s working well! And I loved your son’s naming of your “Triangle Time”!